St Kilda locals are the envy of all Melburnians come Sunday morning. They’re treated to an array of cafes and bakeries in which to start their mornings, just a stone’s throw away from the picturesque bay. On a particularly beautiful mid-morning, the sun will be shining, the tram bells will be ringing and late-risers will be making their way to the Esplanade, coffee in hand, in search of a new, unique handmade product. 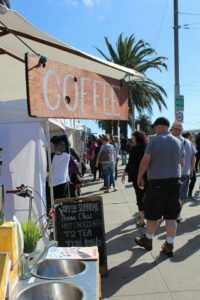 With the sea, Luna Park and the Palais Theatre as its backdrop, it’s little wonder why the St Kilda Esplanade Market is high on the to-do list of every man and his dog (literally) on a Sunday. Established in 1970, the market was originally an exhibition on the Esplanade for local artists and sculptors to display their work, considering the rising cost of holding traditional art exhibitions. The local councillor named this one-of-a-kind exhibition Art Bank and was home to the works of national treasure James Egan, among others. Now, the market is one of the most unique in Melbourne with true quality coming from its artistic roots. 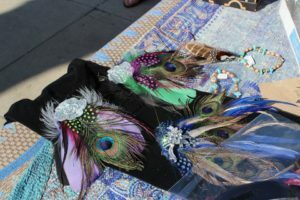 There are now over 175 stalls at the market and some stallholders hold the market so dear that they have remained as exhibitors since the market’s inception over 45 years ago. Such as Domingo at stall 104 with ESPN cutlery jewellery. 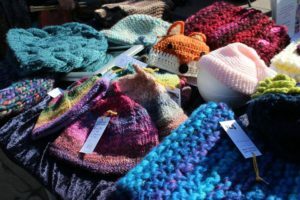 There is a huge range of arts, crafts and other creations ready for you to take home every Sunday, and with Mother’s Day coming up fast, it might be the perfect place to pick up a lovingly handmade gift. It is incredible what these artists are able to create with as much as a piece of wood and a glass bottle. If it’s a unique ornament for the home you’re after, you’ll be happy to find a new clock for your shelf fashioned from an old flattened bottle or polished piece of wood. Unique money boxes can also be found, shaped out of wood into animals of all sorts, such as kangaroos and owls. Textiles are also a big ticket at the market – sass up your bedroom with a retro-style cushion or even your bathroom with a retro toilet paper holder! No market would be complete without a wide variety of hand created jewellery waiting for the perfect owner. Here, you’ll be able to try on anything for fine jewellery of diamonds and pearls see Edward Faingold stall 80, Tony Fitton stall 30 to silver and pewter at Calipso Flash stall 84 or leather, polymer or resin. The idea place to find Mum a gift for mother’s day which is just around the corner. Handmade body products such as soap and skin care are also abundant, as well as soy hand pored candles. If you already have a wide collection, seek out some September Patisserie Candles at stall 24 or Dapamelts at stall 118 for a bit of a twist on the classic. In true St Kilda style, these candles look and smell just like Acland Street bakery and milk shakes around breakfast time. 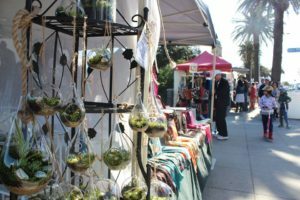 Those with a green thumb won’t need to go far with the very trendy terrariums sold at the market and the no-fuss succulents for sale. When it comes to decorating the house from the inside, there is an abundance of illustrations, paintings and photography on display, many featuring gorgeous impressions of our beautiful city. Mirabela Varga is one artist who will stop you in your tracks at stall 113 with her stunning palette knife paintings. If you’re lucky, you might even get to see a live demonstration. Finally, foodies can be sure that they’ll find something worth eating at the new flavours of the world Foodie Zone. The perfect place to grab a snack from one of the food trucks while you continue to shop arts and crafts. There is also that special take home product like boutique olive oil, roasted nuts, jams, chutney all ready to be sampled. As well as scrumptious homemade Turkish Delight. A fresh coffee is never far away with I Make Coffee van on the sidewalk to fuel your caffeine needs, and specialty and functional teas on sale from Australian Tea House stall 121 too. 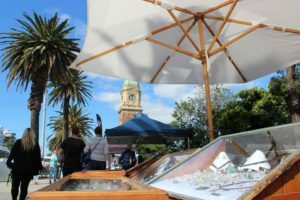 It would take us forever to tell you about all the one-of-a-kind creations on offer at the St Kilda Esplanade Market, so you’re just going to have to pop by yourself. From October to March the market will be open on the Esplanade from 10am to 5pm, and 10am to 4pm from April to September. We recommend getting in early after a leisurely St Kilda brunch to see the biggest variety of arts and crafts, and to catch all the local puppies on their morning walks of course. Head down and find that perfect piece of art or handmade gift for a special someone at the most picturesque and unique market in Melbourne. For more information on what’s on offer at the St Kilda Esplanade Market, visit their website.